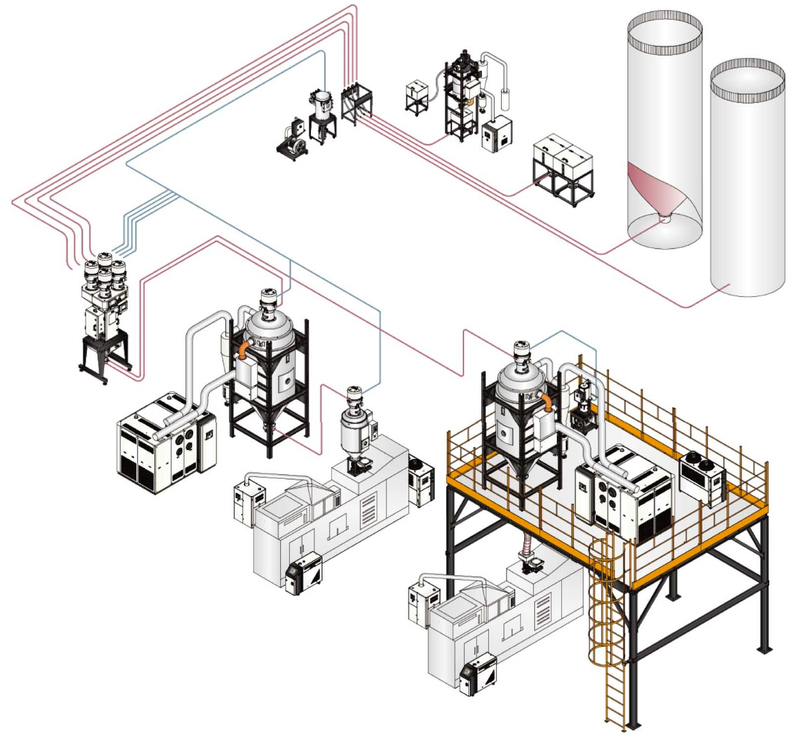 In PET preform system, drying becomes the most critical step which must be seriously taken and the moisture in the material must be removed at a reasonable temperature. Shini dehumidifying dryer can provide dew-point of -40℃ or even lower. Also it can achieve constant detection of all the parameters and stabilize the dew-point. Based on its technology strength and experience in auxiliary equipment field, Shini can meet various kinds of demands from plastics conveying, dehumidifying and drying; mould heating and cooling; regrinds recycling to color management. Adopt intelligent energy-saving control technology to monitor the material processing, Shini can provide different solutions according to different requirements from the customers. All material contact surfaces and filter device of the system are made of stainless steel ensures no contamination during PET material conveying. For high temperature conveying of PET, Shini specially came up with the solution with water-cooling function which decrease the risk of high temperature material conveying. In PET preform system, drying becomes the most critical step which must be seriously taken and the moisture in the material must be removed at a reasonable temperature. Shini dehumidifying dryer can provide dew-point of -40℃ or even lower. Also it can achieve constant detection of all the parameters and stabilize the dew-point. Dew-point of traditional dehumidifiers can not be set and the machines are working full-loaded. However, the humidity requirements of PET material processing are always rigorous. Therefore, the dew-point must be set and controlled properly. Differ from traditional dehumidifier, the new Shini model combines the settable dew-point together with the regenerating control greatly saves the energy. kg/hr. If the masterbatch proportion and precision is demanding, SGD model is suggested which adopt loss-in-weight calculation with output within 0.04~32kg/hr. The inner cooling water system can prevent masterbatch from falling into the PET main stream and melting. Thus ensures accurate dosage. Molding cycles of adding masterbatch can be set to meet the requirements of micro weight measuring. Shini PET crystallizer is specially designed for the homogeneous crystallization as well overcoming glass transition temperature. Also it can avoid material bonding and bridging. With models from SCR-160U to SCR-1600U, the hopper capacity ranges from 160 to 1,600 liters. The material level switch can help adjust the running mode of both the crystallizer and the feeding device based on the actual material level it detects. Adopt accurate temperature detection system and rotary valve equipped at the material discharge port to ensure constant crystallization and avoid material degradation. 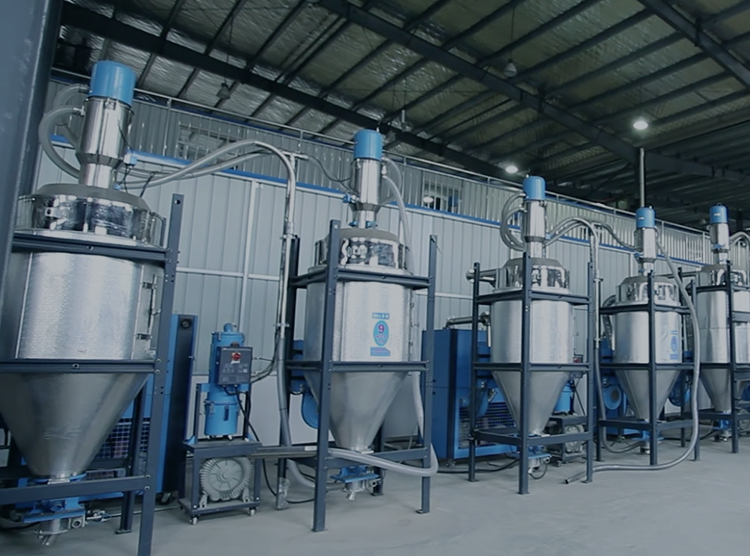 With gravimetric sensor and material level switch, the special gravimetric blender designed for high temperature material is suitable for PET crystallized materials. Ethernet interface attached to the controller works together with the relevant software, material proportion data (max. output, actual output, proportioning accuracy) can be transmitted to control product quality. Recalibration will be automatically started after each weighing to ensure optimal proportion accuracy. Regrinds auto compensation function available. Aberration compensation can be automatically calculated based on the discharge amount of material. Special bridge-breaking structure and discharge way are used to meet all the requirement of sheet material dosing and at the same time ensure the continuity of the operation. When mould surface temperature is lower than the surrounding air dew-point temperature, dew will emerge. The formation of dew will not only lead to poor product quality and reduction of productivity, also the mould surface can be corroded in succession pollute the environment. Shini mould dehumidifier can effectively solve the problem and ensure stable molding condition and maximum production capability of PET system. The chiller of Shini can provide accuracy control of temperature, flow and pressure, cooling effects can be played to the limit. Chillers can be divides into two types, water-cooled and air-cooled. There are other parts of the cooling system, such as cooling tower, pump and water tank. Based on the standard equipment and technology, Shini can come up with individual solutions to meet different kinds of requirements. In PET molding production, water contains play a very important role in the production. To ensure high quality, the water ratio of the PET material must be controlled within the range permitted. AQU 100 water contain tester is dedicated to detect PET material.